This was… unique.. Very, very unique… And very… devilish.. In the ”W.T.F” kind of way. This is literally the Devil’s diary. 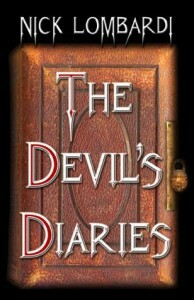 Yes, you will have in your hands (or on your Kindle) the Devil’s diary. I love reading people’s diaries, (I’m just a very curious person, ok?) and this is no exception. The thing is, it’s very long. I mean, the Devil has been around as long as his BFF (“God”) and there are entries from way back. I mean, we’re talking Eve and Adam way back here. So, yeah, it’s very long. It’s pretty funny at first. Not like “ha ha, OMG my tummy hurts from laughing” funny, but funny in a “I’m reading the Devils diary” kind of funny. I found it very interesting too, at first, but then it just went on and on, and suddenly, the Devil’s ongoing thoughts, about how he hates everyone and especially his BFF (“God”) were just getting boring and.. ongoing. There were parts where I did laugh though, and his meeting with Jeanne d'Arc was pretty epic..
Come on now.. That was pretty funny? You get diary entries from days where important/crazy/tragic things happened in real life, so people who don't want to hear the Devil talk about, for instance, terrorism, shouldn’t read this book. Because the Devil? Yeah, he’s quite fond of terrorism. In the end, it’s all in the title. This is the Devils diary, and that’s what you get.